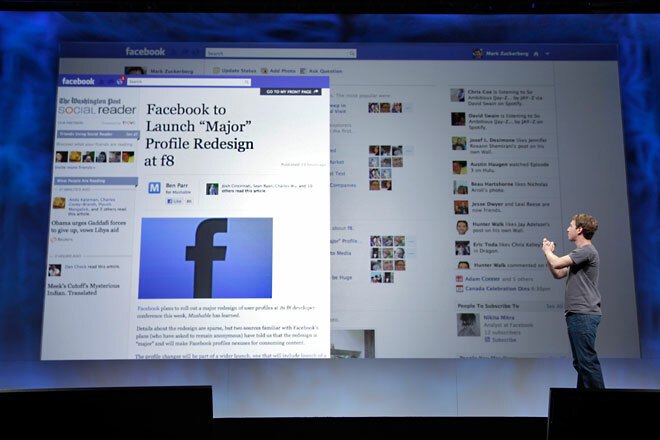 Facebook announced a slew of new products at its f8 developer conference in San Francisco on Thursday, aiming to fully integrate users’ lives through a series of major media and lifestyle-centric application integrations with its social network. “Millions and millions of people have spent years curating the stories of their lives, and there’s no way to share them,” Facebook CEO Mark Zuckerberg said. Facebook’s vision of the future involves bringing its users entirely into its social platform, allowing for the Facebook page to be a sort of one-stop shop, scooping up all of your activities and displaying them in one grand, blue and white frame. The grand plan begins visually. The new “Timeline” product is something of an overview of your past Facebook activity in an entirely different visual format. Timeline goes back into your history of status updates, the apps you’ve used and the places you’ve checked into. The information collected in your timeline is dependent on what sort of data about yourself you want collected over time. So in order to, say, begin collecting data about your music listening habits, adding an application to a user’s timeline is a simple, one-click process. Apps are the stuff of Timeline. Installing this new class of apps onto your timeline will curate and summarize the history of your life as seen through Facebook — a collection of your activities curated and seen on a single page. “It’s a container big enough to hold your entire life,” said Facebook vice president of product Chris Cox.